Theologically Speaking | Exploring how Christian belief influences how we live. Some of you may be wondering what I am up to lately. I have not been posting to Theologically Speaking in some time. Well, I have started a new venture at Shaped by the Word. I would love to have you follow me there! Shaped by the Word is a place where I will be sharing my thoughts each weekday on the Bible passage I am reading that day. I am also hoping to hear back from others who are reading along. So, come join the conversation and read along with me! What does this mean for Theologically Speaking? It will still be here. I have no plans to remove the articles that are here because they still get many visitors every day and I still get messages from people who are benefiting from reading them. I will still post here from time-to-time on things related to Christianity and modern culture. Um, this came across my Facebook feed today and lots of people liked it. Why? I have no idea. The statement on the photo creates a false dichotomy between knowing the Bible and knowing God. It champions the second and looks down on the first. The problem is that to know God, one must know his book. The Bible is an autobiography. God, the author, has told us all about himself in his book and if we want to know him, we read, we study and we do it some more. Now, it is true that you can know all about the author and not know the author. So, you can accomplish the first without the second. 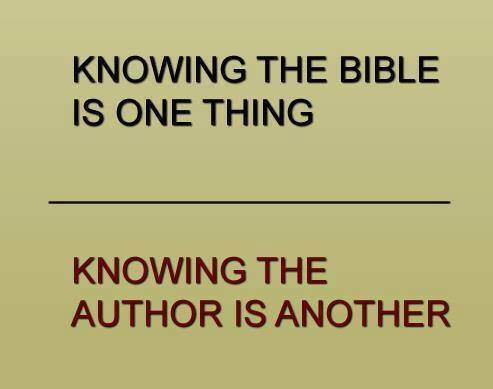 However, it is impossible to know the author without knowing the Bible. You cannot accomplish the second without the first! Do you want to know God? Read his book that tells you all about him. The Bible is not just any book. God wrote it that we may know him and love him. Knowing the Bible is an extremely important thing, because it helps us know the Author. Isaiah 55:10-11 – the word of God accomplishes the will of God. Romans 1:16 and 1 Corinthians 1:18 – the word of God is the power of God for salvation. Romans 10:17 – the word of God creates faith. 1 Thessalonians 2:13 – the word of God performs God’s work in us. Hebrews 4:12 – The word of God is living and active. It convicts. James 1:18 – The word of God brings new birth. James 1:21 – the word of God saves us. I bristle whenever I hear or read statements like the one in the photo above because of the great necessity of knowing the word of God. God wants us to know him and he has revealed himself to us. He did it through his book. We need to know it. Were you born in a barn? Neither was Jesus.